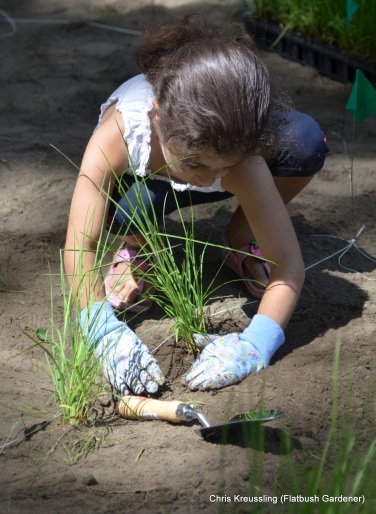 A group of NYC Audubon staff and a team of dedicated volunteers got their hands dirty in Greenpoint, Brooklyn on June 28 and 29, planting a quarter-acre native plant garden in McGolrick Park. After much planning and hard work by NYC Audubon Research Assistant Kaitlyn Parkins, the previously sparse, grass-covered southwest corner of the park has been transformed into an urban oasis designed to attract a variety of wildlife species and promote biodiversity within the park. The new garden, funded by the Greenpoint Community Environmental Fund, is an ongoing project that will engage the local community in caring for the park and increase quality of life for both people and wildlife in Greenpoint. About 40 volunteers from the Greenpoint area came out for the weekend planting event, and put over 4,000 plants into the ground! We planted native wildflowers such as New York asters and black-eyed susans, along with shrubs such as lowbush blueberries, ferns, and grasses (including the broomsedge pictured on the right). We carefully selected plants native to the New York City area that will provide food and habitat for birds as well as beneficial insects, pollinators, and bats. Many migrating songbirds are experiencing population declines due to poor quality stopover habitat. Some of these birds travel over 1,000 miles without stopping, so providing them with sufficient food and water is crucial for their nesting success when they reach their breeding grounds. 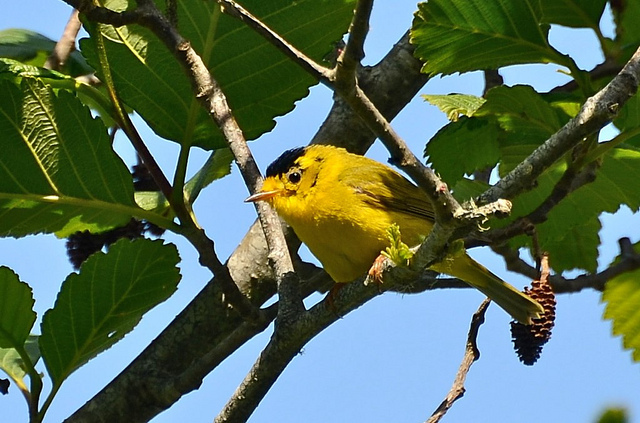 The McGolrick Park garden will provide high-quality habitat and food sources for both permanent residents and migrating birds throughout the year. In addition to benefiting wildlife, the garden will also enhance the Greenpoint community for anyone who enjoys getting in touch with nature. We hope that everyone who passes through McGolrick Park will enjoy the natural beauty of the garden while learning about the importance of native plants and wildlife. Although native plants are relatively maintenance-free once they are established, our new plants could use extra help to ensure they survive their first year. If you are interested in helping care for the garden, email volunteer@nycaudubon.org to learn more.